Like a row of unconventional skittles, half a dozen small restaurants and tascas huddle literally next door to each other on the main road into Santa Ursula. By Jove! Yes, we have struck lucky. It is too hot to be indoors, so we take one of the three tables outdoors, protected from the traffic by a row of shrubs. The boss seems to be serving and doing the cooking, but it is lunchtime, so perhaps they do not expect to become crowded. We espy a chalk board with the legend “five tapas for €10”. Could that be good value? 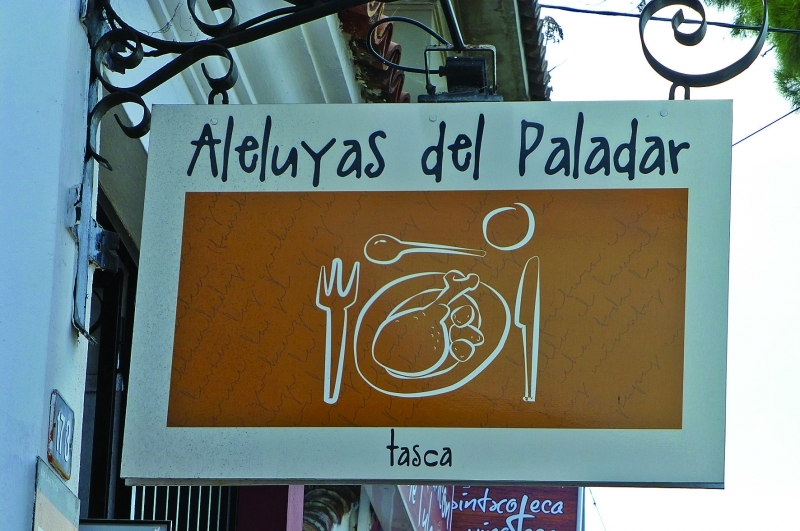 This place trades on its salads and burgers, so what’s with the tapas? When we enquire, we are told that they make up tapas from what they have and, no, if we take that set of dishes, there will be quite enough for two persons, and therefore no need to order a burger to follow. Such confidence! We take him at his word, and five tapas follow each other out from the kitchen at decent intervals. First is a plate of triangles of cured goat’s cheese, accompanied by warm bread. This is followed by a most unusual bowl of pickled strips of aubergine with mustard seeds, tangy and tasty. Next is a bowl of garbanzas (chickpeas), meaty with plenty of tender pork and chorizo. Each plate or bowl is enough for two. We sit back to draw breath and consider that this is all well above the average. What will be next? The answer is a bowl of button mushrooms sautéed in garlic. The final plate of the five offerings is warm morcilla made with added rice (a sweet blood sausage unlike anything you would find in England). It is accompanied by a sweet chilli/red pepper jam and it is sensational! Quite the best we have eaten on this island. We did go back another day, stopping at lunchtime, to try the burgers and salad. As well as a selection of a dozen or so starters, there are half a dozen different salads (mine, garnished with apple, was excellent) and the same number of different types of burger listed on the menu. The beef burger (rejoicing in the name of London) turned out to be cold sliced roast beef served in a burger bun, but we were assured that all other types of burger were served hot. They are generally all under €5 and are accompanied by salad garnish and chips and are more than acceptable, though we could not help but look back on the previous visit and those tapas. There are 12 starters/plates to share on the list, and five different salads. If you go on a Thursday, you qualify for a two-for-one price on your order: just pay for the one with the greater price. And that tapas bill? Yes, really only €10 for the two of us! Plus a couple of beers at €1 each. This place is only four kilometres out of town (Puerto de la Cruz) but it is as though we have removed to a different planet with a parallel pricing structure. Do make the effort to try them out. Produced with news.CMS in 0,0742 seconds.